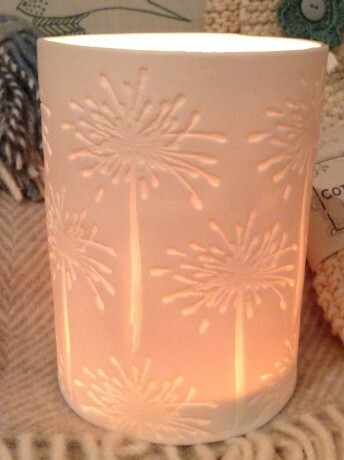 Our beautiful handcrafted porcelain tealight holder with an Agapanthus design is created in Cape Town by the well known ceramic artist Catherine Landman. Catherine's inspiration is taken from nature and her surroundings. These influences are evident in her beautiful contemporary ceramics collection. Multiple agapanthus flowers have been etched into the delicate porcelain before the tea light holder is fired. The agapanthus is indigenous to South Africa and instantly recognisable amongst gardeners around the world. When lit the candle light creates a lovely glow through the delicate porcelain thus highlighting the agapanthus shapes on the outer surface. Each tealight is unique and like a piece of ceramic art. Being a handmade article expect variations in shape and size due to the shrinkage that occurs during the firing process.